Homoeopathy has been confronted with certain major issues such as (i) how is medicinal property of homoeopathic drug transferred to and retained by the vehicle; (ii) how can it act in biological system in the absence of any original drug substance in ultra high diluted remedies? and (iii) plausible mechanism and pathways of biological action including mysteries of ‘like cured by likes’. We demonstrated through controlled studies the ability of ultra-highly diluted homoeopathic drugs in rendering protection/repair of cytogenetic damages inflicted by whole-body X-irradiation in mammalian model mice in vivo. We examined cytogenetic damages in arsenic, cadmium, mercury and stannum intoxicated mice and their remediation by homoeopathic drugs derived from agitated ultra-high dilutions of their respective salt, deploying many scientific protocols. We made a human trial on efficacy of Arsenicum album against groundwater arsenic-contaminated victims. We tested efficacy of some homoeopathic remedies in cancer of mice and thalassemia in human. We produced nano-capsules of homoeopathic mother tinctures and their bioactive components and induced nano-precipitation of silver from silver nitrate by homoeopathic mother tinctures and characterised them for their physicochemical properties and biological action. We studied tissue distribution of nanoparticles, precise mechanism and pathways of their action that involved certain signal proteins and their pathways, both in vivo and in vitro. This approach made a significant contribution towards elucidating the role of drug nanoparticles in inducing ‘memory of water’ and mechanism and pathways of action of homoeopathic remedies through epigenetic modifications that supported ‘gene regulatory hypothesis’. Context: The lipopolysaccharide (LPS)-induced cytokine release and oxidative stress are validated experimental parameters used to test anti-inflammatory activity. We investigated the effects of homoeopathic mother tinctures, 6 CH, 30 CH and 200 CH dilutions of Arnica montana, Thuja occidentalis and Bryonia alba against LPS (1 μg/ml)-induced cytokine release from RAW-264.7 cells and human whole-blood culture. Materials and Methods: For in vivo evaluations, mice were orally treated with 0.1 ml drug dilutions twice a day for 5 days followed by an intraperitoneal injection of 0.5 mg/kg LPS. After 24 h, the mice were sacrificed and serum levels of pro-inflammatory cytokines and nitric oxide were determined. The extent of oxidative stress was determined in the liver homogenates as contents of reduced glutathione, malondialdehyde, superoxide dismutase and catalase. 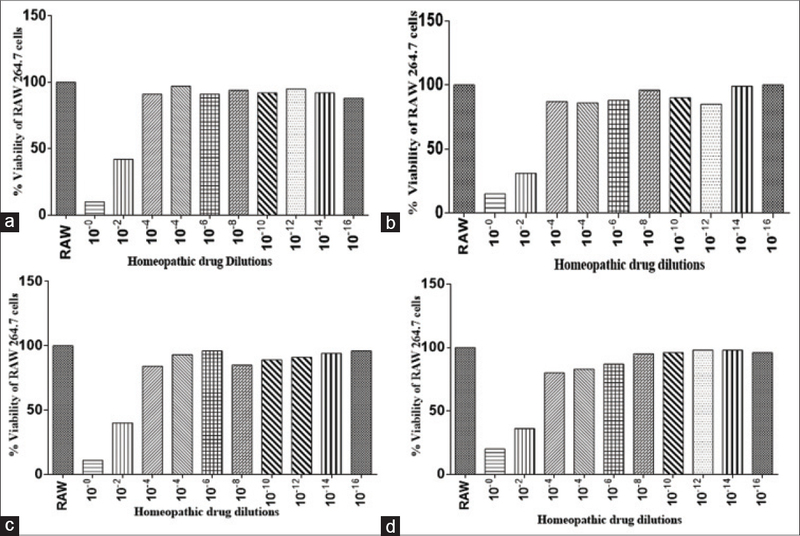 Results: The tested drug dilutions significantly reduced in vitro LPS-induced release of tumour necrosis factor-α, interleukin-1 (IL-1) and IL-6 from the RAW-264.7 cells and human whole blood culture. Similar suppression of cytokines was evident in mice serum samples. These drugs also protected mice from the LPS-induced oxidative stress in liver tissue. Conclusions: Our findings substantiate the protective effects of Arnica, Thuja and Bryonia homoeopathic dilutions against LPS-induced cytokine elevations and oxidative stress. 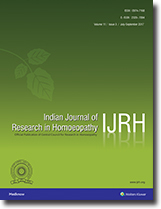 This study authenticates the claims of anti-inflammatory efficacy of these homoeopathic drugs. Introduction: Homoeopathy is a widely used, controversial alternative system of medicine. It is assumed that homoeopathic medicines are slower in action and does not work in acute conditions such as ‘fever’. The study aims to estimate the effectiveness of some homoeopathic remedies in fever and to compare their effects with Paracetamol. 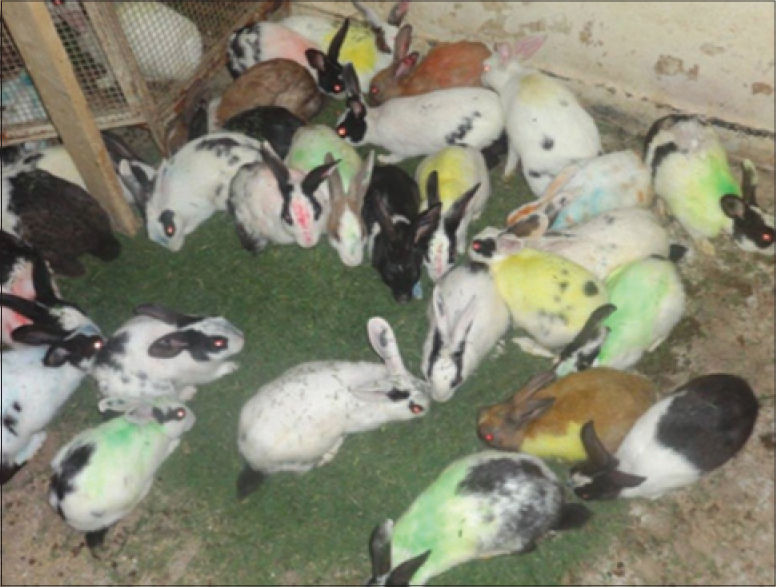 Materials and Methods: Baker's yeast fever model of rabbits was used in the study. Rabbits were divided into four different groups (n = 6). Rectal temperature was measured before and after fever induction hourly. After fever induction, medicines were administered orally. Paracetamol and Typhoidinum in 200C and 1M potencies were given orally. ANOVA followed by post hoc test was used for statistical analysis of results. The results were considered statistically significant at P ≤ 0.05. Results: Fever was induced in all the rabbits after 4 h of baker's yeast administration. The results of the study revealed the significant effectiveness of Typhoidinum in 200C and 1M potencies in baker's yeast-induced fever (P = 0.05). Typhoidinum in both potencies showed less significant results as compared to Paracetamol. However, all the medicines’ effects were significant compared to the negative control. Conclusion: Typhoidinum 200C and 1M worked against baker's yeast-induced fever. However, the results were slower and less significant than Paracetamol that might be due to lack of similarity of remedy picture and disease picture. Background: Atopic disorders represent a major health problem worldwide affecting 5%–30% of the population. The present study evaluates the action of Bromium 30C in reducing serum IgE levels. Objective: To assess the variation of serum IgE levels before, during and after intervention with Bromium 30C. 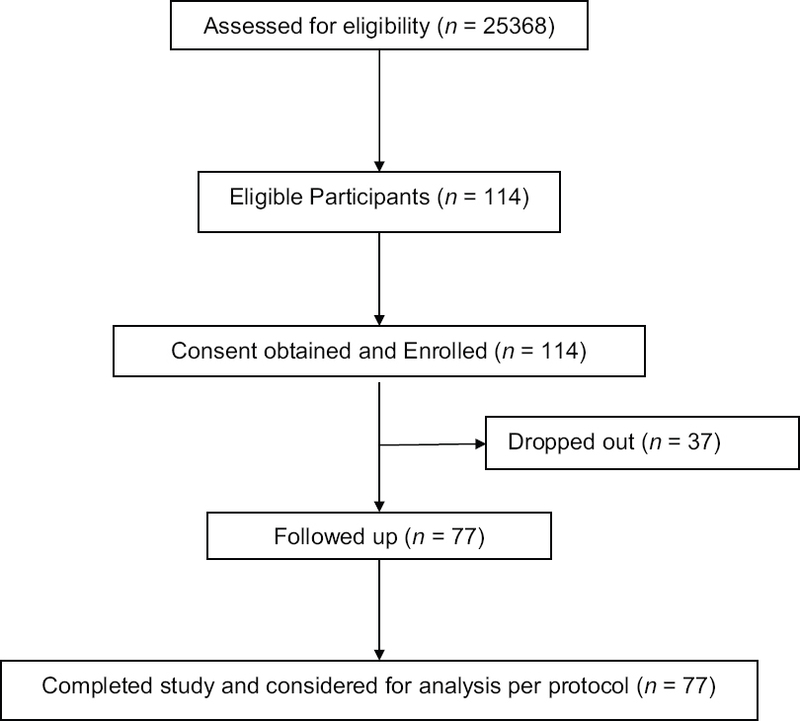 Materials and Methods: Thirty cases of atopic respiratory complaints (diagnosed based on clinical history, CMDT guidelines and serum IgE values during the first visit) were selected as per the inclusion criteria using purposive sampling technique. Bromium 30C was prescribed for these cases and followed for 3 months. Bromium 30C was repeated twice daily for 2 weeks and placebos were administered in between. Serum IgE values were checked every month. The data was statistically analysed using mean, standard deviation and analysis of variants (ANOVA). Results: ANOVA for repeated measures showed P = 0.000, which is highly significant. Pairwise comparison of serum IgE levels in before and during, during and after treatment groups showed P = 0.007, which is highly significant. Pairwise comparison of serum IgE levels in during and after treatment group showed P = 0.016, which is significant. 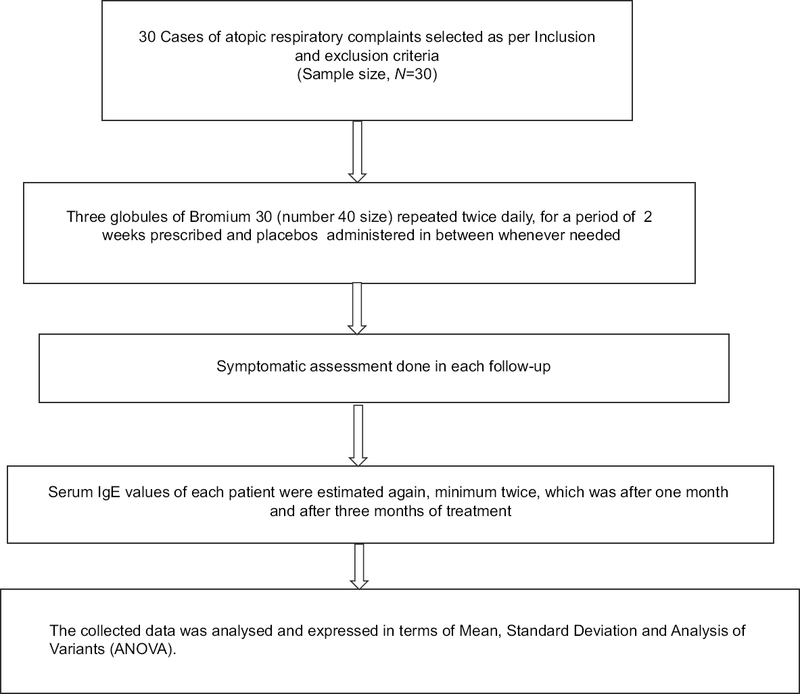 Conclusion: There is a significant reduction in serum IgE levels in cases of atopic respiratory complaints during and after homoeopathic treatment with Bromium 30C. Introduction: Clinical verification is an ongoing research program of the Council that verified many rare homoeopathic drugs. Aim: To clinically verify the ‘symptomatology’ of Mangifera indica by ascertaining the symptoms improved during verification. Materials and Methods: The study was a multicentric open label observational trial. Total 114 patients were enrolled after matching with the available symptom compendium and eligibility criteria in five centres of the Council. The medicine was prescribed in 6C, 30C, 200C and 1M potencies, as per need of the patient following the homoeopathic principles and protocol developed by the Council. The collected data were presented in terms of descriptive statistics. Prevalence of symptoms in the responding and non-responding population has been compared using Chi-square test. Results: Among the total 114 patients enrolled in the study, 77 patients who completed the follow up were analysed, as there were 37 drop out cases. The demographic analysis shows, male/female: 41/36, mean age 28.61 years. There was “clinical success” in 65 cases (84.41%) and failures in 12 cases (15.59%), judged subjectively by the physicians. A minimum of two prescriptions were considered for pick listing each symptom as a rule of thumb. Conclusions: Total 16 CCRH proving symptoms were verified, 4 symptoms from other literatures were also verified. 51 new clinical symptoms/symptom components were identified. Further replication and estimation of likelihood ratio in general practice setting is crucial for confirmation and inclusion of such symptoms in homoeopathic literatures. Fibroadenosis also known as fibrocystic breast disease constitutes the most frequent benign disorder of the breast causing constant breast pain. The only known treatment in conventional medicine is anti-inflammatory medicines which give temporary relief or surgical excision which results in scarring of breast tissue. 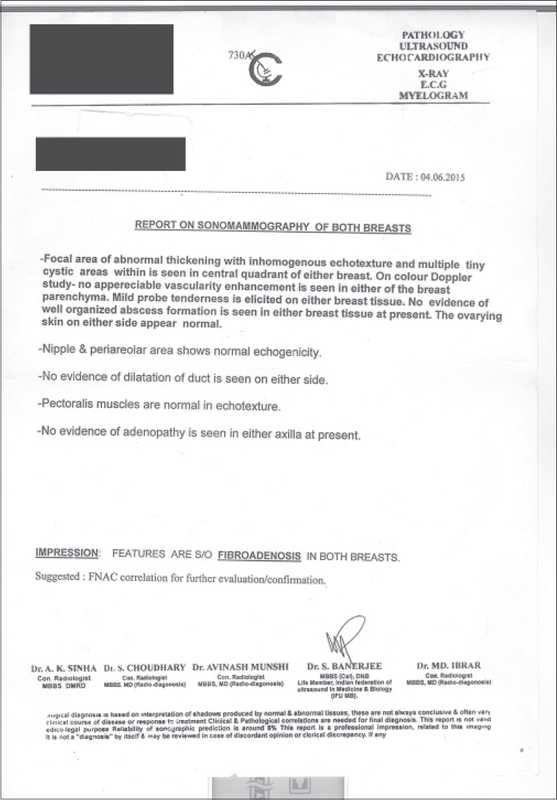 The homoeopathic literature shows that cases related to breast lump, mastitis, etc. have been treated successfully; however, no case study/research trial has been documented till date in any peer-reviewed journal. The case reported here is of fibroadenosis in 31-year-old female who was treated successfully with individualised homoeopathic medicine within 6 months with no recurrence. Phytolacca was prescribed as a constitutional remedy on the basis of totality of symptoms and after repertorisation. Investigatory procedures such as mammography and ultrasonography were done before and after to record resolution of cysts. The patient has been observed for more than 1 year without recurrence which can be considered as near permanent cure through individualised homoeopathic treatment. Resolution of cysts in this case of fibroadenosis with Homoeopathy can be considered a lead to explore the utility of alternative modes of treatment such as Homoeopathy to give a better therapeutic option for such surgical conditions. A national convention on World Homoeopathy Day was held to commemorate the 262nd birth anniversary of Dr. Samuel Hahnemann on 9th–10th April, 2017 at National Agricultural Science Complex, Pusa, New Delhi, India. 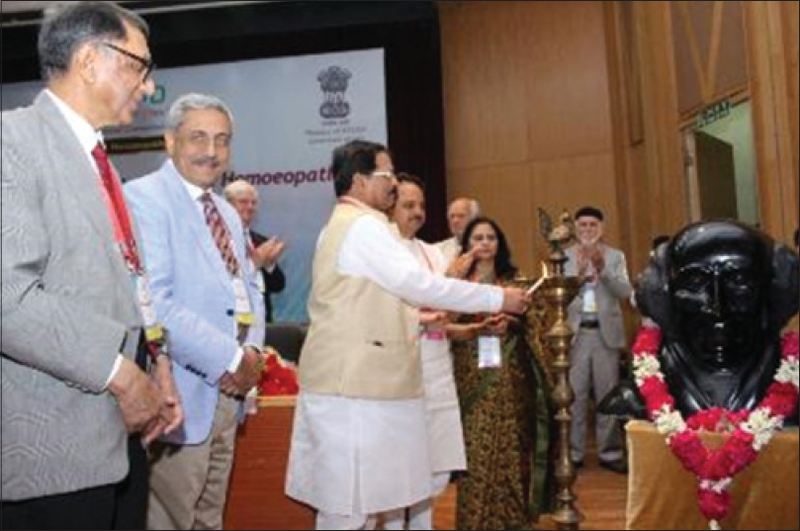 The theme of the convention was ‘Enhancing Quality of Research in Homoeopathy’ inspired by the World Health Organization Traditional Medicine Strategy 2014–2023 for achieving Universal Health Coverage. Organised by the Central Council for Research in Homoeopathy, an autonomous research organisation of the Ministry of AYUSH, Government of India, the convention witnessed 11 oral presentations and focused group discussions held in parallel in the main and side hall, respectively. On this occasion, Awards of Excellence such as Lifetime Achievement Award, Best Teacher and Researcher Award, Young Scientist Award and Best Research Paper Award were also given.